The Custard TV: Does the BBC have another hit on their hands with Line of Duty? Does the BBC have another hit on their hands with Line of Duty? It’s too easy and maybe even clichéd to say that new BBC2 drama Line of Duty starts with a bang. But as it’s late and it does literally start with a bang that’s so loud I nearly leapt out of my seat we’ll go with that. From the first second you know Line of Duty is going to deliver. Police load their weapons and run to a rooftop whilst deep orchestral music booms to set the tone. The tooled up police then ascend the staircase and your mind begins to race as to where this might be heading. With sniper rifles firmly trained on a window and more officers entering the building, the tension continues to grow. The opening scene is as gripping as any I’ve seen in a TV drama. It’s a scene that wouldn’t seem out of place in an episode of Spooks. “Flat 56,” a young policeman radios from the ground. You know something big is going to happen and 2 minutes in I’m completely beside myself with a strange mix of excitement and concern. The scene continues and so I barely have time to give the butterflies in my stomach any attention. The police enter ‘flat 56’ and shoot the occupant. It’s a clean and brutal kill. The tension calms slightly and reveals a baby crying! What! Where is this going?! A woman in the flat erupts in hysterics and now I’m confused. I had been rooting for the police, following every tension filled maneuver with as much detail as I could muster but now I begin to wonder what are we really witnessing here. It transpires the police believed the occupant of ’flat 56’ to be a suicide bomber. OK, but no bomb is found in the house or on the deceased. A terrible error of judgment or miscommunication has occurred. As the distraught baby continues to wail in the background my pulse lowers and I start to relax. The pacing of this new police corruption thriller is exhausting. It’s not one to watch in your slippers with cup of tea in one hand and a digestive in the other. The continual surprising twists and turns will more than likely result in a dropped cup of tea and a broken biscuit and no one wants that. The plot then takes a turn as the young policeman who mistakenly gave the order is moved or “promoted” to anti-corruption. By this point I knew I’d be hooked. It’s ten minutes before we meet the man at the centre of the piece. 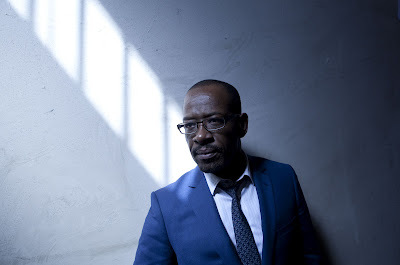 DCI Tony Gates (played brilliantly by Lennie James) is a suave, sophisticated yet down to earth man who, in his first scene, charismatically tackles a youth with a knife. Gates pins the youth up against a shop window with surprising ease. As a result of his selfless act of bravery Gates receives two rewards. Firstly he gets his meal (that was rudely interrupted by the incident with the knife) on the house and secondly he receives the accolade of ‘Officer of the Year’. As Gates accepts his award the crowd of smartly dressed colleagues clap enthusiastically but it’s then that the audience learn that “Gates has the highest clean-up rate in the business and apparently “no one’s that good”: Aha! A light bulb moment as I realise that Gates, with his almost James Bond like style and quick reactions to people with dangerous cutlery may not be all he seems. The interesting and exciting thing about Line of Duty is the fact that it presents the audience with a puzzle of their own to solve. Who can be trusted? Where is this going? Is what we’re seeing and hearing a true picture of each character? Answers are few and far between in this opener and that served to intrigue and interest rather than annoy me. Gates is a conundrum too. He’s likeable but ever so slightly sly and mysterious. Impressions of him flip flopped a lot throughout the first episode and by the end of this opener I don’t feel any more qualified to make a definite call on his character. Yes some aspects of the plot feel a little far fetched and silly but the minor problems and clichés that sneak into aspects of the script are dwarfed by the performances and the interesting way each character behaves. There are tiny elements I found hard to swallow. The first example of Gates and his possibly corrupt behavior comes when he helps cover up a hit and run that his “friend” Jackie has committed after a drunken night out. The full extent of their relationship isn’t revealed in episode 1 but Gates wastes no time taking control of the murder and deleting files from the computer. It’s here that the story begins to plod slightly as Gates discovers the full extent of Jackie’s actions that night. Gates learns he’s under investigation and there’s quite a lot of police procedure to sit through but you can feel it building and building. Even in slower moments it’s the quality of the performances that kept me from reaching for the remote. Vicky McClure, Lennie James and Adrian Dunbar are all absolutely fantastic. Each character seems conflicted and tense and it makes for an interesting hour. The first episode of Line of Duty may not set the drama world alight but there’s enough tension and intrigue to keep me glued for the remaining episodes. There’s a feeling in the air that this could turn into something special and with the quality of recent BBC dramas I’m certain it will. Lennie Talks about the story.